Our last three work days have been spent at Bowthorpe’s Southern Park building fences and a kissing gate. The mains water supply to Bowthorpe has been upgraded with a new feed from Colney cutting a swathe through Southern Park. Temporary fences were installed around the work area and the completion of this provided an opportunity for the Fringe Project to reconfigure the fenced area to better manage the grazing on the site. We also had some new toys to play with! 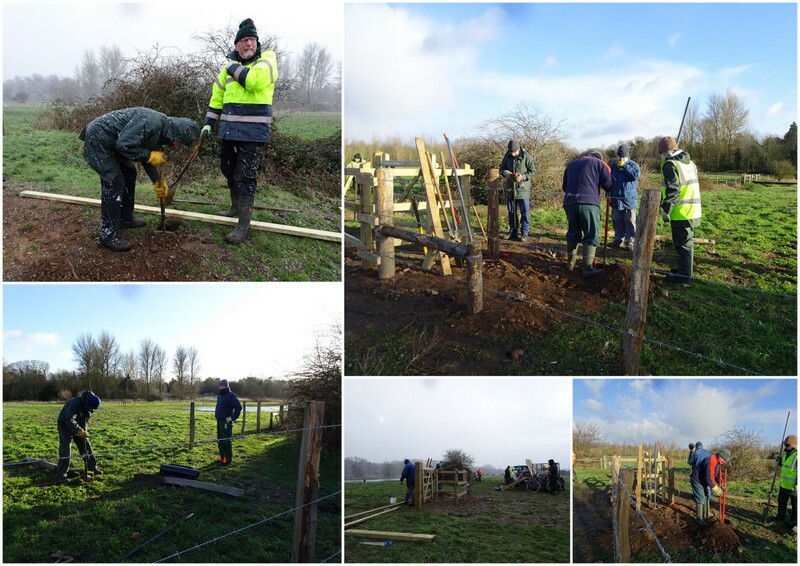 On our first day on 11th January we had two tasks: remove the temporary fence and install a kissing gate. 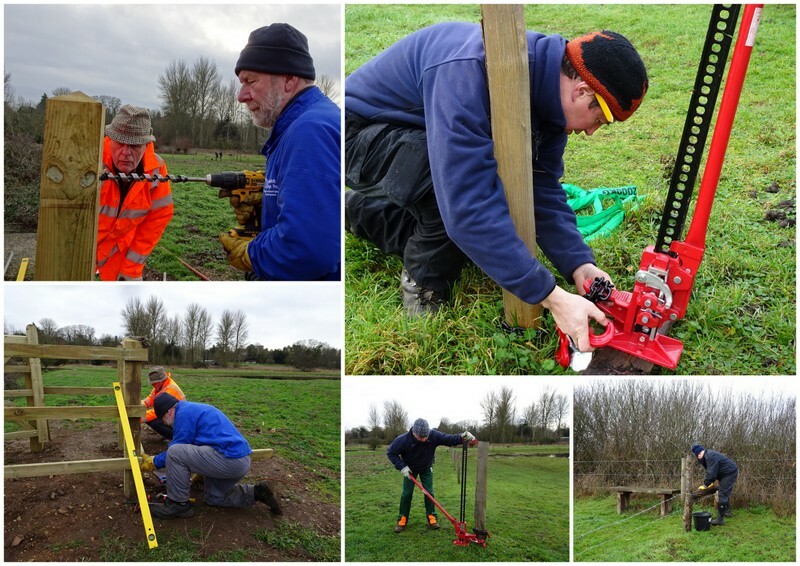 The first of our new toys is a farm jack which we used to remove the old fence posts – usually a very difficult job. Once in they don’t like to come out and it can take a lot of pulling and pushing to get them sufficiently loose to finally lift out. This is where the farm jack earned its keep! It is similar to a car jack but uses a chain to hold the object in place with a long handle to help lever the post out of the ground. It needed two strong people to operate it but with some effort it lifted the posts out a lot easier than using just muscles. But before the posts could be lifted the barbed wire had to be removed and rolled up. So most of our team spent the day removing the old fence saving the removed barbed wire and posts for use on the new fence. Work also started on building a box strainer for the new fence line. Meanwhile Alan and I built the kissing gate. Avid readers of our blogs will recall how we spend time determining the position of the hanging post by walking through various scenarios before finding the ideal location. This is because we are usually installing a gate in an existing fence or boundary line so are constrained by how it has to fit in with this. This time we had more of a free hand on location as the fence was yet to be built. We knew roughly where that would be, so settled on a location for the structure and agreed the orientation of the gate. It was now time to try out our second new toy – a post hole borer or auger. A bit like a giant corkscrew the auger drilled a 4inch hole in the ground. It got us started on the site for the hanging post but with lots of large stones and gravel from the recent water works it was tough going and we had to resort to our traditional tools. On less stony, softer ground the auger quickly dug holes. Anyway, Alan and I diligently worked on with the building of the gate. Holes were dug, posts were inserted, the gate was hung, and other posts and rails fitted. By the end of the day we had a magnificent kissing gate standing in isolation in the middle of a field. On our next visits on 17th and 18th January we built the new fences either side of the kissing gate. On one side a post and rail fence were built and on the other longer side a barbed wire fence was installed. It was a cold day on the Thursday, and we had three box strainers to build plus around 120 feet of barbed wire fencing and 40 feet of post and rail fencing to install. We had a good-sized team of volunteers on the Thursday so could spread the tasks out amongst us. We were reusing the old fence posts and rebuilt the box strainers matching up the posts used previously. A box strainer provides a strong termination point for wire fences able to withstand the weight of cattle pressing against the fence. It consists of two strainer posts set around 4ft apart and braced by a horizontal beam which sits in a mortice on each post and is tightly bound together with wire. (See our blog, Marston Marsh – The Joy of Box Strainers about box strainers). The main strainer posts are 8ft and buried 4ft, so a deep hole was needed in the stony ground. We had lots of holes to dig which kept us warm on a very cold day with flurries of snow to contend with. Getting the spacing right between posts is the key plus matching up the mortices on the reused posts. The final tricky part is wrapping the wire around the strainer posts and getting this as tight as possible. We resorted to use of a Spanish windlass to get the right tension. 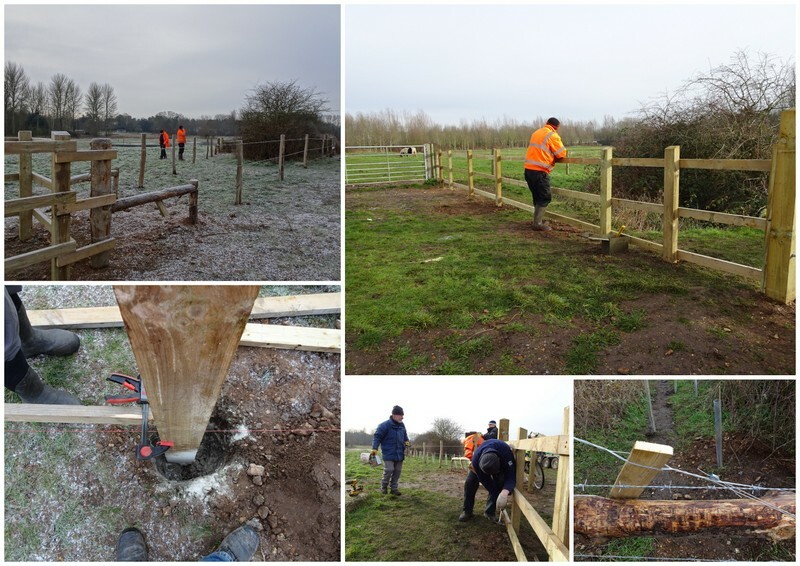 By our finish time on Thursday we had built all three box strainers and installed the posts and three strands of barbed wire on one side of the area. Keith led the construction of the post and rail fence on the other side of the kissing gate. They had eight posts to install plus three sets of rails to attach. The fence ran over a culvert and the pipes for this were not very deep under the soil, so the posts had to be positioned around these. The auger helped to get the holes started but there was still a lot of digging to do. The land also sloped so setting levels and deciding heights of rails had to be worked out. By finish time the team had dug all holes and installed around a quarter of the fence. 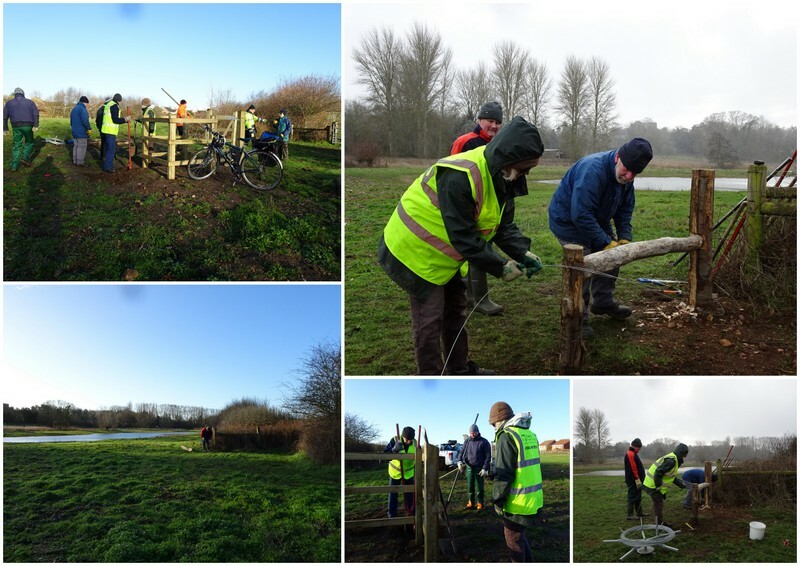 Our return on a brighter but very frosty Friday saw us completing the barbed wire fence, creating a new triangular fenced-off area which we planted-up with whips. The main task though was to complete the post and rail fence, installing the remaining posts and the rails. We had to finish by noon so that Matt could attend a meeting in the City. So, it was all hands to the pump to get the posts in the ground and the rails cut and fitted. With some people drilling and others nailing, the rails were all fitted in place and the fence completed. We finished at 11:55! Another job well done. Our Blog, Around and About – A Digest of Recent Work Days covered our work around the new footbridge linking Southern Park with Colney. We had also fenced-off a culvert in September as part of the work for the new bridge. A letter to the Eastern Daily Press on 12th December 2018 congratulated and thanked all concerned with the construction of the bridge and the writer thought that it was a stunning structure providing a vital link for walkers and commuters to the Norwich Research Park. 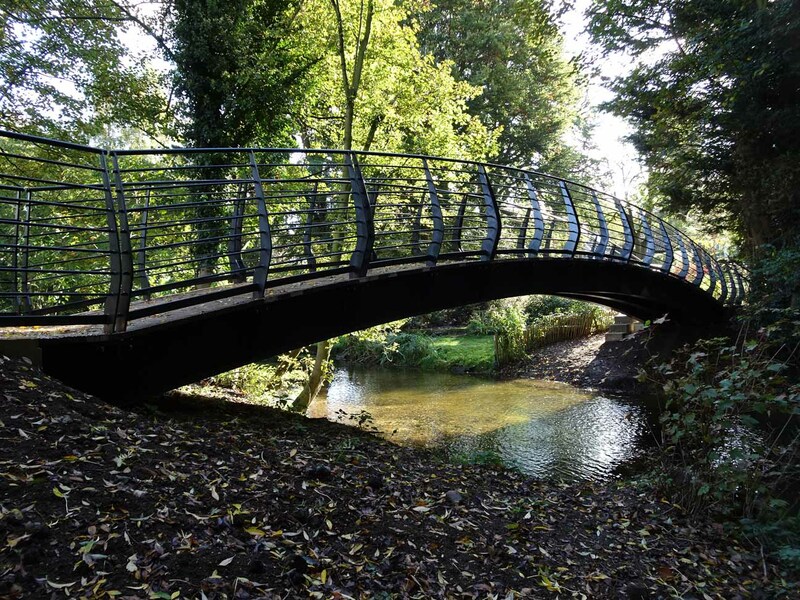 The bridge was built by contractors working on behalf of the City Council’s Landscape Team and the Norwich Fringe Project has also undertaken work in support of this as set out in our Blogs. Old maps show a ford at this location and apparently some 60 years ago there was also a rickety bridge across the River Yare at Colney made up of two tree trunks suspended between concrete pillars with a wobbly handrail. This bridge disappeared and for more than 50 years the Yare Valley Society has campaigned for a new footbridge which they have since dubbed as “The Bridge of Dreams”. It is always good to hear that projects such as this are appreciated and make a real difference to people. Most of our work is in publicly accessible areas and helps to maintain the sites for leisure and pleasure. We enjoy what we do and learning new skills is part of this, but we also enjoy the teamwork and camaraderie that comes with it.